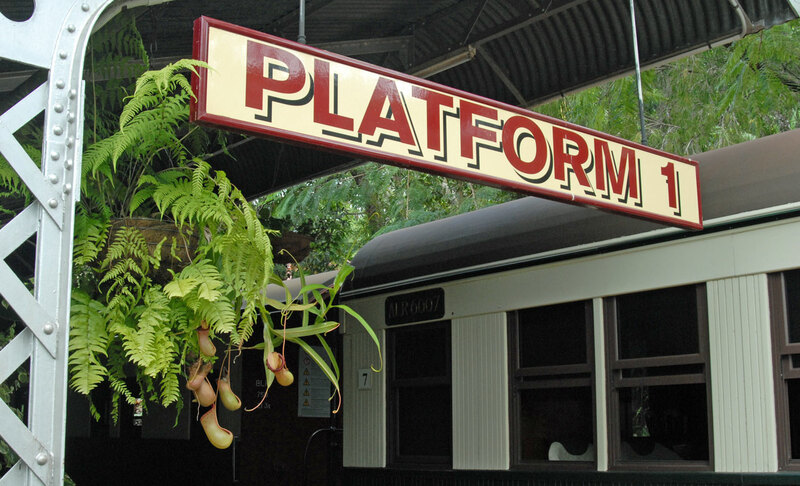 When the miners and timber getters brought their tin and silver and red cedar from the Atherton Tablelands to the coast, they loaded it into bullock carts and hauled it along a dirt track to Port Douglas. That was not the only route to harbour — pack mules also negotiated a precipitous track that followed the gorge of the Mulgrave River* — but it was the only way to shift heavy loads. But every wet season, the rains turned the track into a morass, bogging carts and stranding the goods. So the miners and timber getters and other Tablelanders lobbied the government for decent access. Explorer and prospector Christie Palmerston got the job of finding a suitable route up the mountains. That barrier behind Cairns beat even Christy Palmerston, in so far as finding a track for wheels was concerned. He suggested, though, that it might be just possible to hew a railway line up along the side of the Barron Gorge. In 1882, the Queensland Minister for Works and Mines announced the construction of the railway. Work began in May 1886. An awe-inspiring job, especially for those days. It took five years to lay the first twenty-five miles to Myola, easily the worst section. In the gorge section of fifteen miles, a bridge under difficulties had to be built over every creek and ravine, some built over hundreds of feet of space; ninety-eight curves had to be blasted round the gorge side, fifteen tunnels blasted, huge escarpments cut from the mountain-sides. Fatalities were inseparable from such a hazardous job, illnesses and floods and landslides. But the line went through. 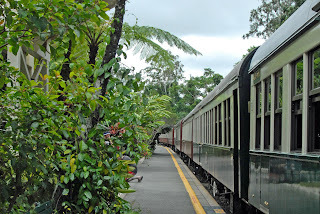 The railway carried goods to and from the Tablelands and tourists to the village of Kuranda, near the Barron River Falls. 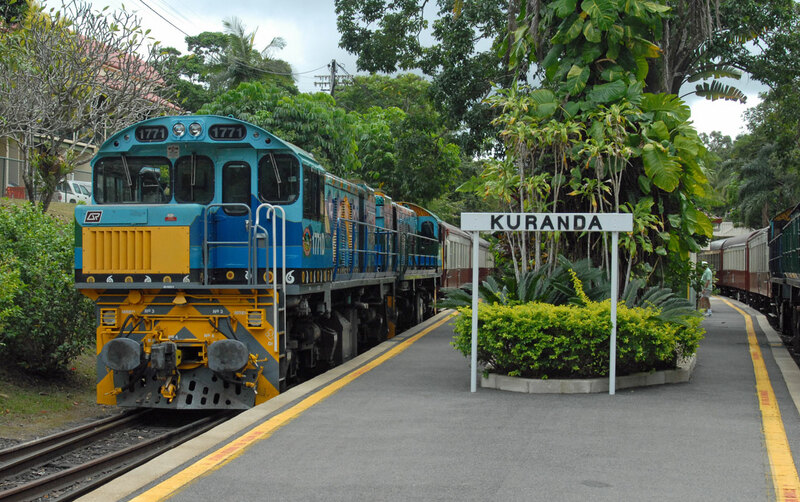 Kuranda Railway Station opened in June 1891 and was upgraded in 1915. 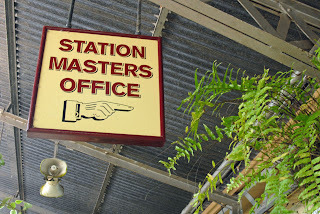 Queensland Railways had always intended it to be a show station, a spectacular destination in the rainforest. The current planting scheme is similar to the original. (Perhaps not the pitcher plants on Platform 1.) The buildings are also little changed. A road was constructed during World War II. This road now brings huge numbers of day-trippers up the Range to the village, but the railway remains a popular way to travel**. Excerpts from Ion Idriess (1958) Back of Cairns. * At the time, it was described as 'the worst road in the world'. The Gillies Highway follows the old track. It has 263 bends over 19km. And is probably marvelously scenic if you are brave enough to take your eyes off the road. ** I was not wearing an anorak when I took photos of the rolling stock. Amazing what drive and determination let folks back there accomplish! One day I hope to see the famous Kuranda railway. From the satellite, it all looks more-or-less flat. Mick, it must have been an amazing time! I can barely get the energy up to cut back the overhanging vegetation on the river track here. Denis, although Kuranda isn't that high --- only 330m --- the land does get to that height quite quickly! As well as the train, there's the cableway (Skyrail), so you can vary your mode of travel. That place has everything! Thanks Snail for the travel advice.